Our Chicken Eggs are known for their supreme quality, freshness and nutrition. We are trusted Supplier and Exporter of Fresh Chicken Eggs from Thailand. The Fresh Chicken Eggs offered by us are a good source of choline, which helps regulate the brain, nervous system and cardiovascular system. 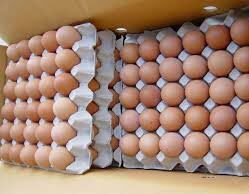 Owing to our reliable logistics network, we are capable of delivering bulk orders of the Chicken Eggs within stipulated time.